Mariners 2019 season preview mailbag: What to expect of Felix Hernandez? It might not have the same tradition as the red, white and blue bunting hung throughout the ballpark on opening day or fans skipping school and work to go see a game on what feels like a national holiday. But as the Major League Baseball season reconvenes, it also brings the triumphant return of the weekly Twitter mailbag. What better way to make the 2019 debut than as part of The Seattle Times’ Mariners preview. But unlike the Mariners, there is no stepping back in the mailbag this season in terms of effort or production. As always, these are real questions from the eclectic collection of people who follow me on Twitter at @RyanDivish. Thank you for this opportunity. What to expect from King Felix as a player and team mate ? 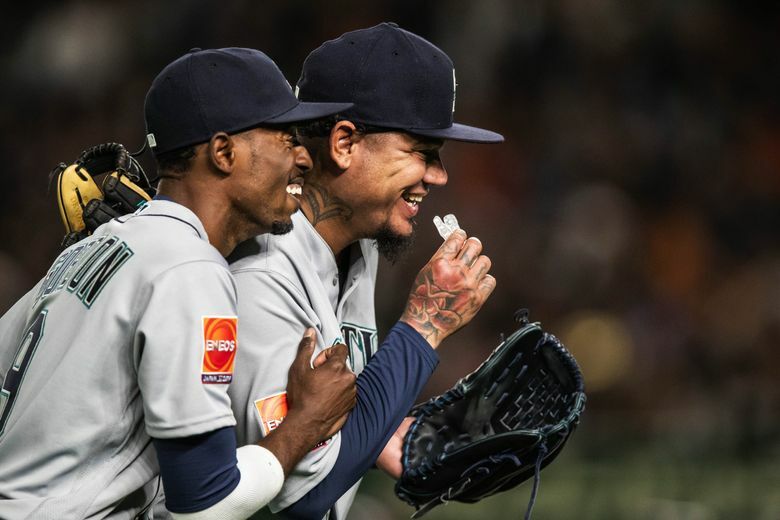 There seems to be a perception among some fans that Felix Hernandez will become a horrible teammate who will somehow infect the rest of the clubhouse because of his status in the rotation and with the organization. Yes, he was upset that he wasn’t allowed to start on opening day for the Mariners for an 11th straight season and a 12th time in his career. It’s an honor he believes he earned from his years of success with the Mariners, which outweigh the last few seasons of struggles. That sort of pride might be off-putting to the average fan, but it’s not uncommon in professional sports. If pro athletes didn’t have such unabashed self-belief, they likely would not have ascended to such heights. He’s not the type of person to be a problem in the clubhouse. The Mariners have had plenty of players with petulant personalities, selfish motives, back-biting intentions and questionable makeup. Hernandez doesn’t fit that profile. Starting pitchers often exist in their own worlds, given their schedules, and Hernandez isn’t a malicious person or teammate. He’s gregarious by nature. Is he a big fan of manager Scott Servais or GM Jerry Dipoto? No. They were not here to see Hernandez when he was pitching at his highest level. They have seen only the diminished version of Hernandez, which doesn’t generate much reverence or respect from them. As a player, it’s impossible to predict what to expect from Hernandez, and it’s unlikely he knows. He simply doesn’t know whether he will be able to command his pitches from one out to the next, or even one inning to the next. Think about all of the blow-up innings he’s had over the past few seasons that torpedoed an otherwise capable start. His struggles come from lack of command — being able to manipulate the baseball so it does what he wants. Control is throwing strikes. Command is throwing quality strikes. Hernandez’s command has a tendency to disappear. While some fans will obsess over his diminished fastball velocity, Hernandez could be better than average with a 90- to 91-mph fastball if he could command it. Meanwhile, hitters have adjusted to his offspeed pitches, particularly his changeup. They know the counts he likes to throw it in and often “sit on it” because it comes out of his hand looking like a pitch in the bottom half of the strike zone. Nothing we’ve seen from Hernandez this spring says it will be different this season. The same infrequent glimpses of greatness and frustrating inconsistency seem likely in what should be his final year in the organization. The only question is how long the Mariners would keep him on the roster if he struggles to produce. who will be most missed from last years roster and who will be forgotten? The only answer is Edwin Diaz, with Mike Zunino runner-up. No, I haven’t forgotten about Nelson Cruz or Jean Segura or Robinson Cano. All three are talented players. But Diaz changed the entire complexion of the game and the Mariners’ season. His success is a major reason the Mariners won 89 games. Think about this: The Mariners never lost a game when Diaz entered with a lead — they were 66-0. Even the games he blew saves, he never imploded to the point where the Mariners couldn’t come back. They were 61-0 in his save situations. Get a lead to the ninth, and it’s a win. That’s a comfort most teams don’t experience. A good closer can cover up so many issues for a team, and his numbers were astounding. He converted 57 of 61 (93.4 percent) save opportunities, while posting an earned-run average of 1.96 (16 ER, 73 1/3 IP) with 124 strikeouts and 17 walks in 73 relief appearances with the Mariners in 2018. The 57 saves tied Bobby Thigpen’s total in 1990 with White Sox, which is the second-most in MLB history. Of Diaz’s 57 saves, 27 came when he entered the game with a one-run lead, which is an MLB record, surpassing Eric Gagne’s total of 24 one-run saves in 2003. The Mariners went 66-0 in 2018 when Diaz entered the game with a lead, including 61-0 in his save opportunities and 30-0 when he entered with a one-run lead. When you have struggles at the closer, there is a domino effect on the rest of the bullpen. The Mariners never had that last season. There was a consistency there that won’t be replicated in 2019. Zunino is runner-up because of his defense and leadership behind the plate. His receiving and pitch-framing ability were mentioned often along with his work with the pitching staff in calling games. Pitchers trusted him and believed in him, which shouldn’t be overlooked. It will be noticeably different this year with Omar Narvaez, who is a better hitter than Zunino but behind in terms of defensive responsibilities. Hmm. I’m using traditional development paths for outfield prospects Jarred Kelenic and Julio Rodriguez and players in the organization with assumption Dipoto isn’t trading his prospects. Also not adding any free agents from a class that could include Mookie Betts, Trevor Bauer, Chris Archer and J.T. Realmuto.